Happy owners of the dishwashers are faced with a difficult task: it is necessary to correctly set the "assistant hostess and a modern facade to issue properly. Select the location of the dishwasher machine. Usually it affects one important factor is the version of the dishwasher purchased. There are three types of components: a partially embedded model, pornostream and standing. Those dishwashers that are built partially in plain view is always a control panel, and the rest of the front is hiding behind the beautiful facade of the furniture. Fully integrated model dishwasher is entirely hidden behind the doors of the kitchen Cabinet. Another thing freestanding dishwashers: they are a real decoration of the kitchen, but because they do not embed. If you have purchased fully integrated built-in dishwasher, push it into a niche which previously was left under this unit. 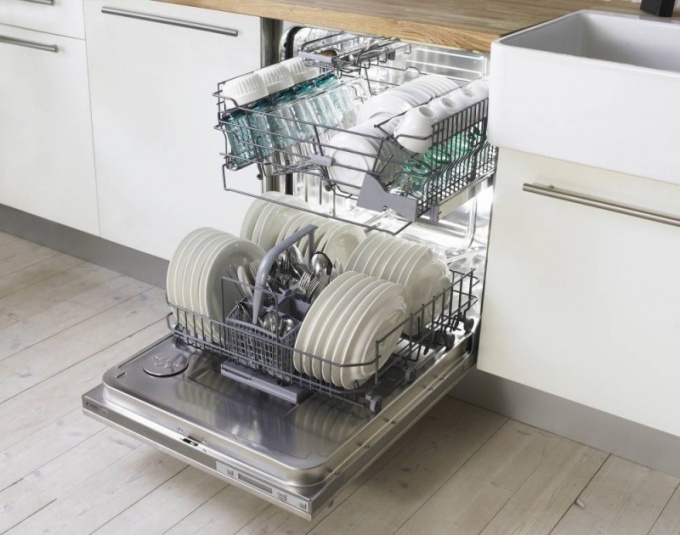 With the adjustment of the base of the dishwasher "configure the unit: the height of the dishwasher should match the displayed level of the tabletop. In some models of dishwashers, for example, Bosch, Siemens and Aeg, the height adjustment Assembly is made using special screws located at the front of the device. Complete with fully integrated built-in dishwasher machines supplied patterns, in which the Cabinet front is fixed to the door. Into the corresponding slots on the housing of the dishwasher, attach the mounting elements. Then the inside of the door of the dishwasher appliance, Unscrew the short screws and long screw such that they can "grab and furniture facade. The door of facade attach handles and other decorative elements that are present in the design of other built-in furniture. Pay attention to the regulation of the door! When opening the unit it must not plummet to the feet and in front of to slam. The easiest method of installing wood facade on a dishwasher – attach the facade to the door unit using double-sided tape and then fix it, Krutov with the inside of the door screws. The appearance of the house dishwasher – the event definitely worthwhile. But extracting the new, you suddenly discover that it still needs to install: connect to the water, Sewerage and electric network and may be hung facade. If first two operations are best left to the professionals to install the facade is quite possible independently. There are two types of dishwasher: installation in a finished kitchen or set-apart. Shed the facadeand is produced only in the first case, and any difficulties with it should arise, because all the world's leading manufacturers describe in detail this procedure in the enclosed instructions. For its implementation you need furniture panels, countertop, roulette, suitable fittings, screwdriver set. So, first install a dishwasher machine 's prepared for her niche and with the help of special screws lock at a comfortable height for you. Keep in mind that complete with the fully integrated models of dishwashers are attached templates, with which furniture facades are attached to the door of the dishwasher. Attach the fasteners into the grooves of her body. Then instead of "native" short screws from the inside of the door install prepared longer bolts with nuts that will be able to grab the furniture facade. There is very little to fasten the handle and other decorative elements (if any) on the door facade. There is another method more simple, when, in order to lock the door facadeand before installing the bolts use double-sided tape. Experts also recommend to connect power supply use cable with a diameter of 1.5 mm and a grounded electrical outlet, is not less than 16 A. For connection to the water supply it is recommended to use the tap with external thread 25. If you installed the dishwasher machine at some distance from the sink, you will have to lengthen water supply hose.